The ever-vigilant SteamDB have unearthed a gem in their usual post-update trawl of Steam’s beta files. A few new lines in Valve’s verse are concerned with app types for music, plugins, film and TV. Existing app types include demos, DLC and drivers. 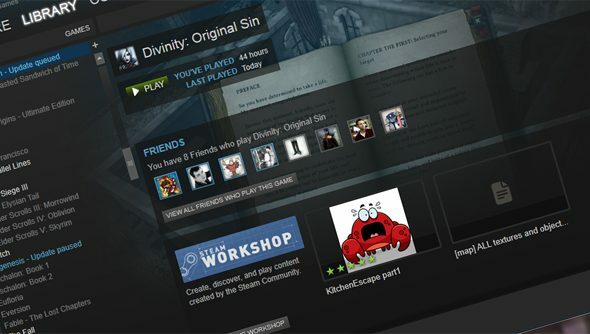 It looks like these new categories will slot right into Steam’s existing architecture. The news is consistent with the introduction of Steam Music a few months back – an integrated media player run through Big Picture mode. An early version of the Steam Music beta was sent to testers in February. Valve have launched films on Steam in the past – most notably their own Dota 2 documentary Free-to-Play, and the Sundance award-winning Indie Game: The Movie. But these are downloaded directly to the game library, and currently collated only under the user-created Movie tag. If Valve are to win their wider campaign to conquer the living room, it makes a kind of sense that they’d offer an alternative to Xbox’s TV suite. Last we heard, the first wave ofSteam Machines had been delayed into 2015 – but were also headed for this week’s Gamescom, and benefitted from an extra thumbstick on the Steam Controller. Could you forsee Big Picture mode becoming your new Netflix?